I revived a dormant discussion on DIY rack building on the HUBB (cited in Part 1) and users came up with several more good ideas on materials, joints and designs. One particularly interesting example was a mini-rack for a TTR made from regular soldered 15mm copper tubing, but filled with epoxy resin (right) and which had proved itself on a ride across Africa. 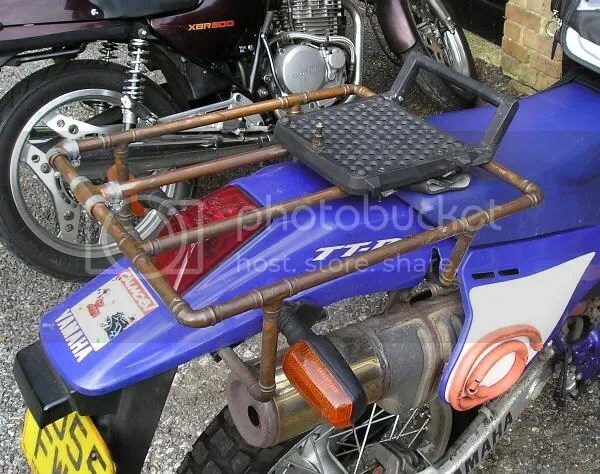 It shows the measures and techniques DIY-ers explore when they don’t want to get bogged down in welding – most probably because making your own rack for an overland bike is not a project on which to learn that skill. Tubes, round or square, are easy enough to find in the wall thickness and diameter you want, it’s how you join them together and to the bike’s subframe that gets complicated to do well without welding. A while back I was advised to try ECT steel conduit (left) used to house electrical wires outside buildings. 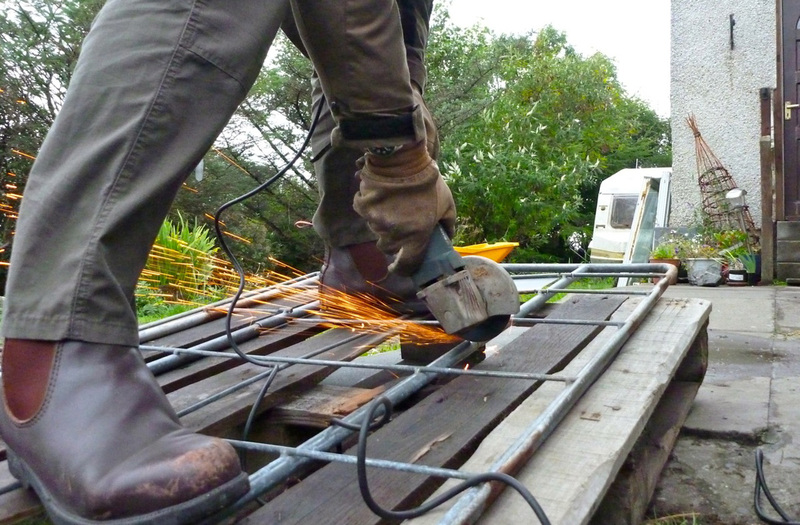 At that point it was going to be welded for me but that opportunity slipped by. 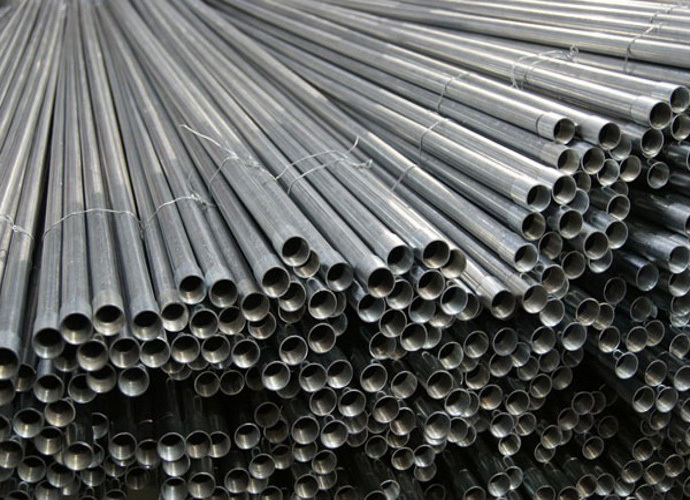 Then I thought of joining round-section tubes with pre-formed threaded joints, but that required threading the ends of the ECT – more palaver. 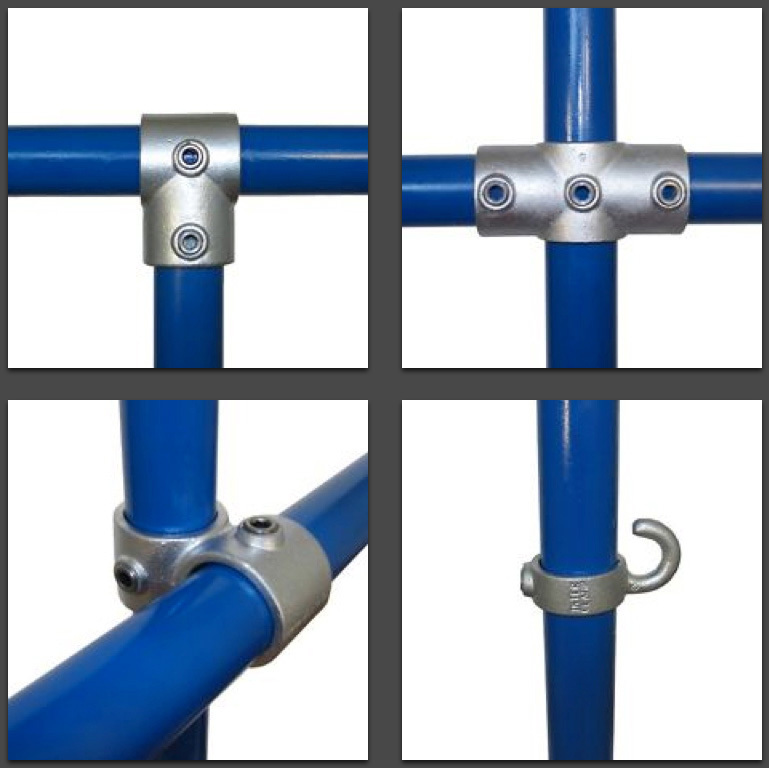 I then found cast hex-key clamps used for assembling sturdy handrails and racks (right). 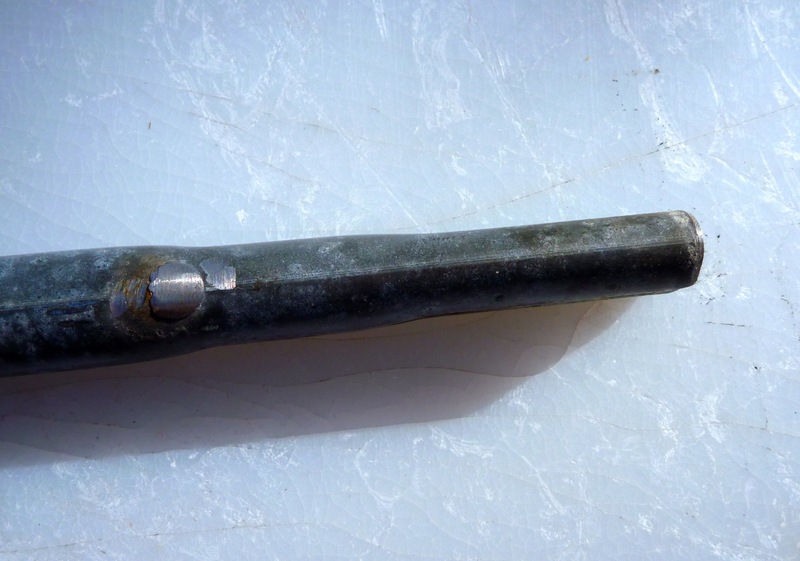 They come in the usual elbows and Ts so I bought a batch but misread the recommended pipe bore (19mm, √) for the clamp bore which was nearer 28mm, not √… They would work best if you were building something like say, a sturdy handrail (did I just read that somewhere?) from at least 28mm ø tubing and where weight is not an issue. And because the hex key presses down onto the pipe, that needs to be a thick-walled pipe so will weigh a ton. Short answer: not suitable for moto racks. Meanwhile, digging around the back of an empty factory turned up the galvanised side rail of an open-sided distribution trolley (left) which by chance had a couple of parallel 3/4-inch members almost the same distance apart as the bike’s pillion mount points (below right), which meant two less corners to join. I don’t know how I can tell but the rail looks like pretty soft mild steel but it is 2mm thick which ought to be OK with enough support spread about. I don’t believe those hex-key clamps would have made a particularly rigid structure compared to welds but after all, my much crappier 1982 rack survived the ride. 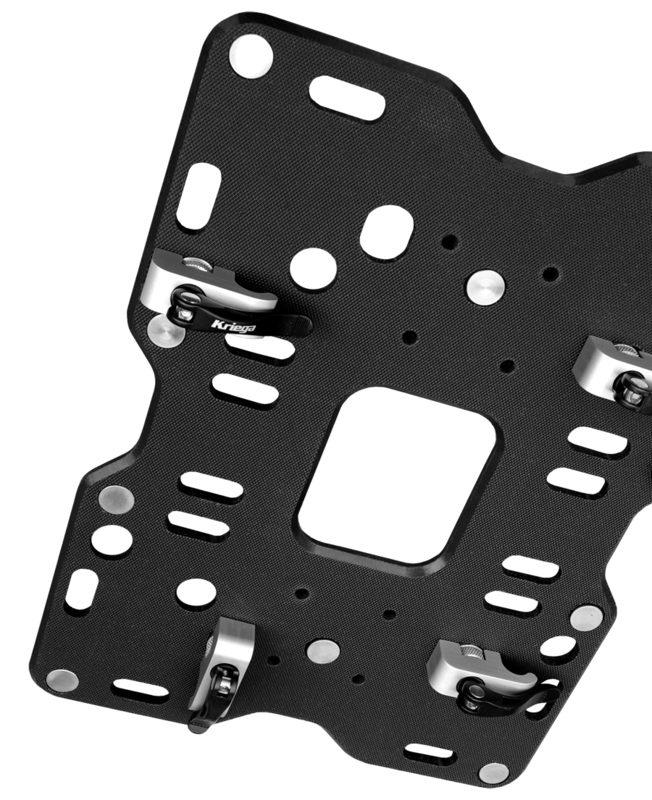 As I mention in the book, you need to try and balance the flex of your rack with the flex of the subframe. 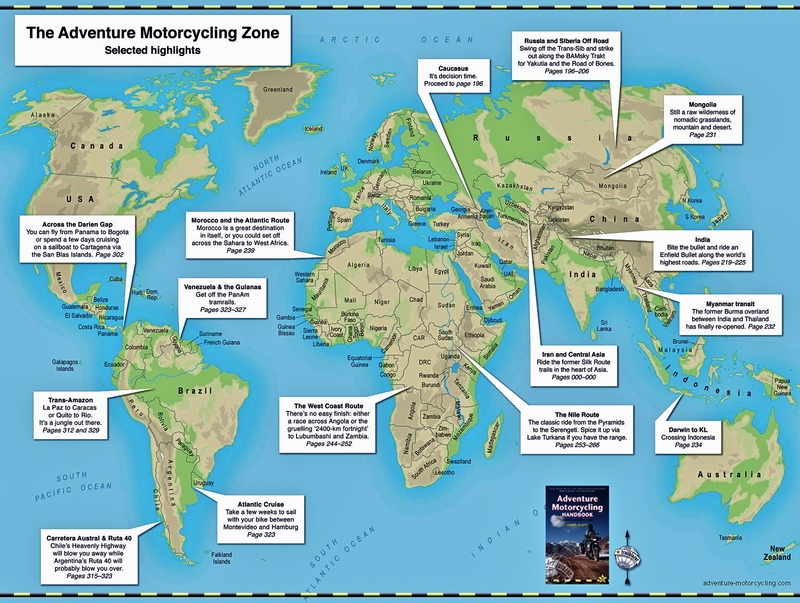 Something’s got to give in a crash, and in most cases better the rack than your bike’s subframe which have bent or cracked on many bike’s I’ve ridden with. 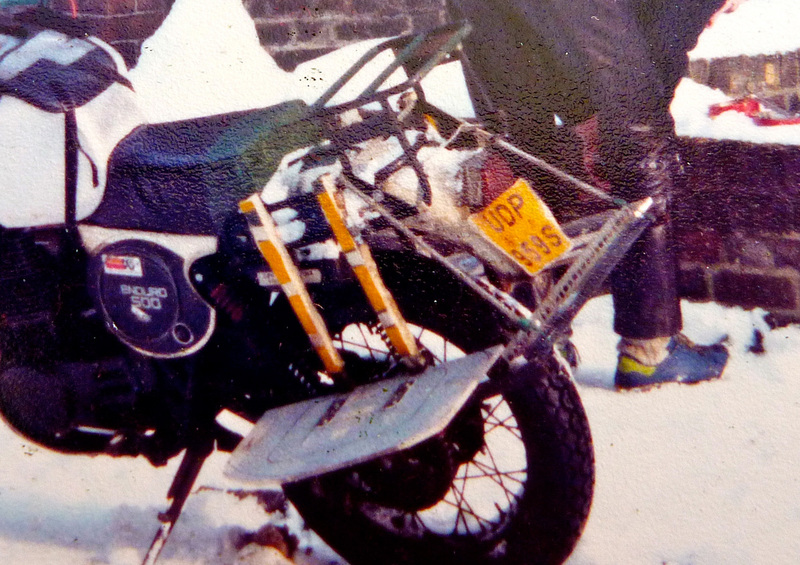 I’ve already established that the GS’s subframe is not so rigid but a slackrack will suit it well. 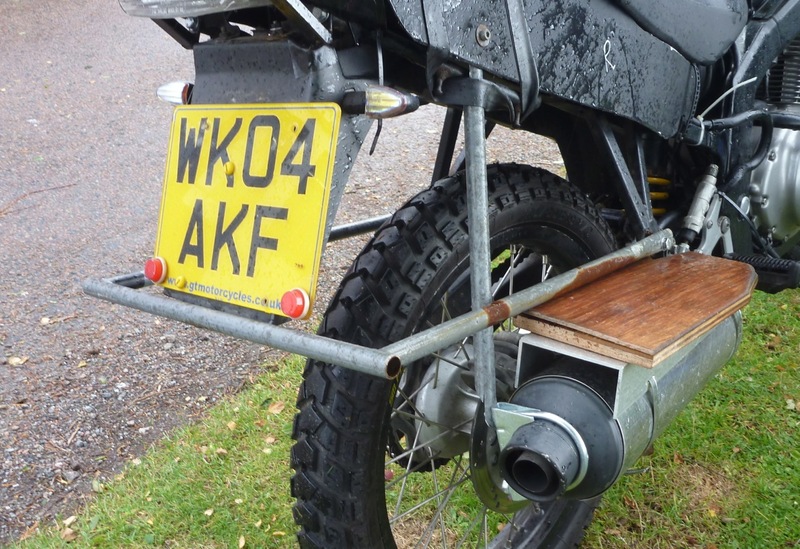 I decided it would be less complicated and more symmetrical to mount the rack the same way on the pipe-rack side – off the ground-down pillion peg mounts – and sort out the silencer-end support once it’s all done. If I was really cheap I’d just crush the tube ends in the vice, whack a hole through the flattened section and bolt it to the bike; you get that with proper off-the-shelf (OTS) racks and it looks crap. I’m only slightly cheap and figured this key point needed something stronger. Plus crushing that tube flat completely felt like it might weaken it. So to dissipate forces I came up with the idea of a two-stage crush (top right) with room for a slug of quarter inch flat bar to be inserted a few inches up the flattened pipe to beef up that whole area (left). 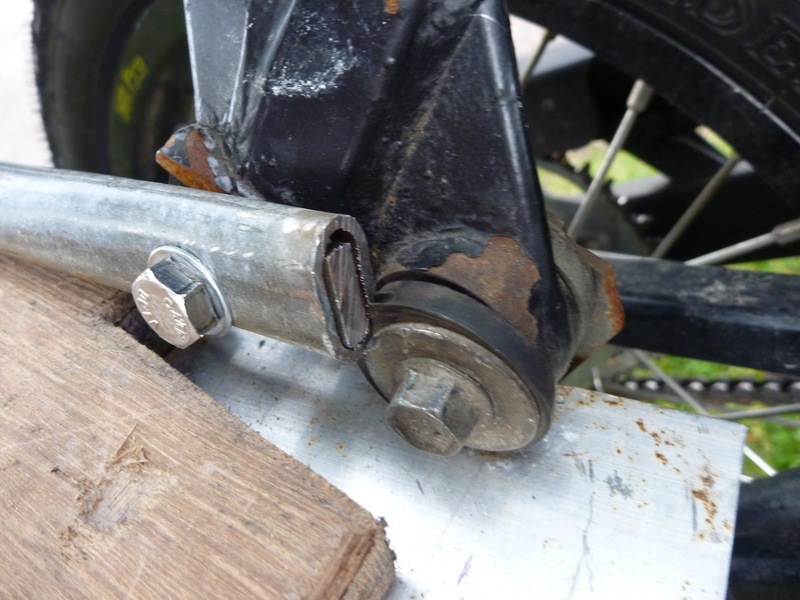 By chance the RHS rail rests on the wooden pipe rack board, but of course the pipe end needs some support nevertheless so, lacking a bit of ordinary flat bar to do the job, I trimmed some more of that 3/4-inch pipe and attached it from the exhaust clamp U-bolt to the bike’s rear subframe. Mostly under tension, it ought to be enough to contain the downward force on the rubber-mounted silencer and stop it snapping midway. To achieve the same on the other side I have two ideas: either using a 10mm-thick nylon plastic plate I found on the beach, the same stuff they use for chopping boards. 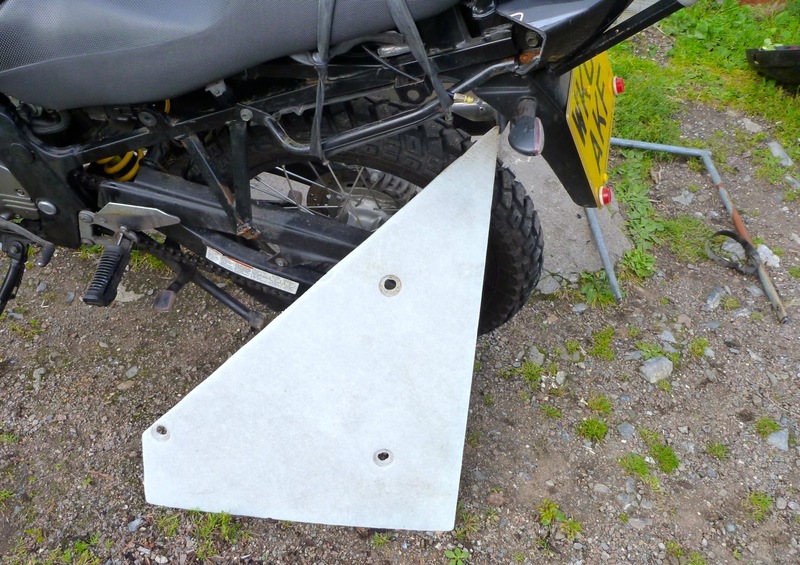 That is strong enough and easy to shape as well as drill things to or add cut-outs; it’s similar to the Kriega platform (right). But lacking a CNC machine the way I do it it might well look a bit crap. 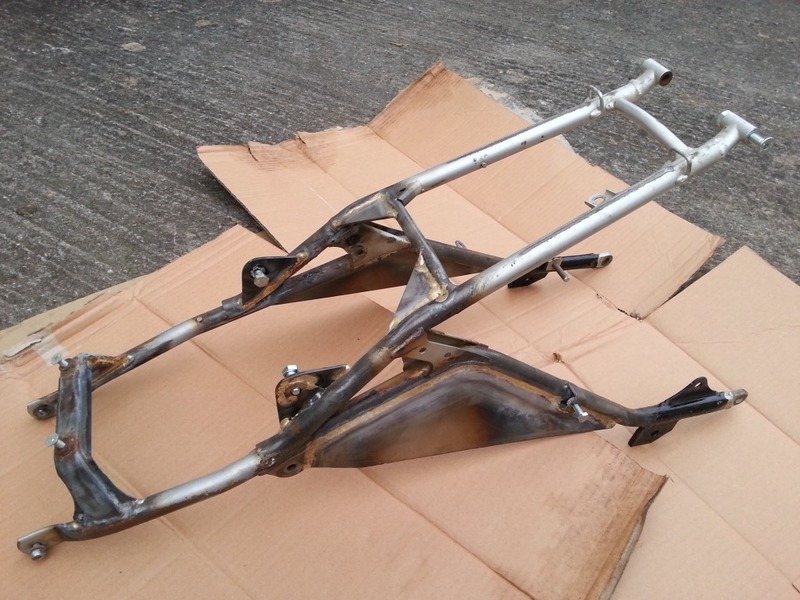 Before the rack cometh the subframe, often a weak point on mono shock motos though not especially on the square-sectioned GS500. 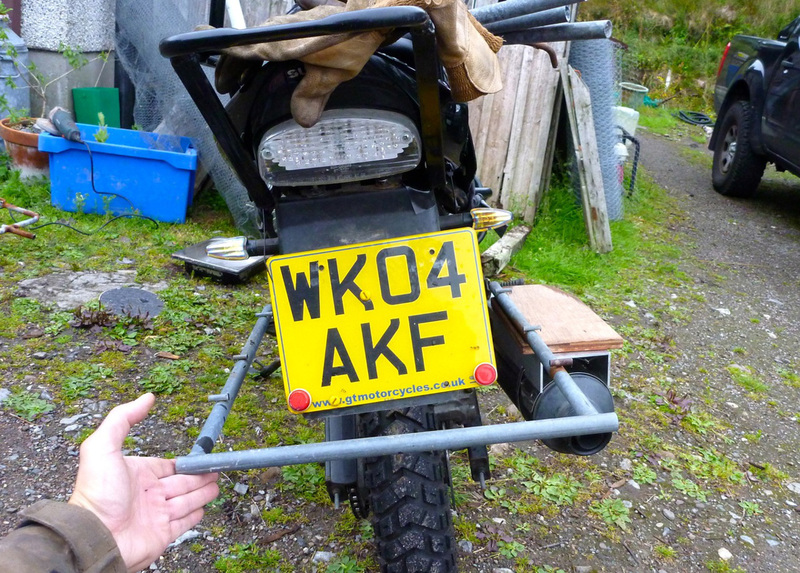 I like the way this notoriously skimpy XR400 subframe has been strengthened with a plate at the back of the subframe triangle for possible luggage duties. The other idea is to be a little more conventional and use the regular 18mm steel tube rectangle on which most OTS racks are based. Usually they’re 350 x 250mm which works for me and Metal Mule sold me one cheap. When it turns up I’ll try and visualise which will be the least difficult and most functional to attach to the LHS horizontal member: tubed rectangle or plastic plate sawn to shape. 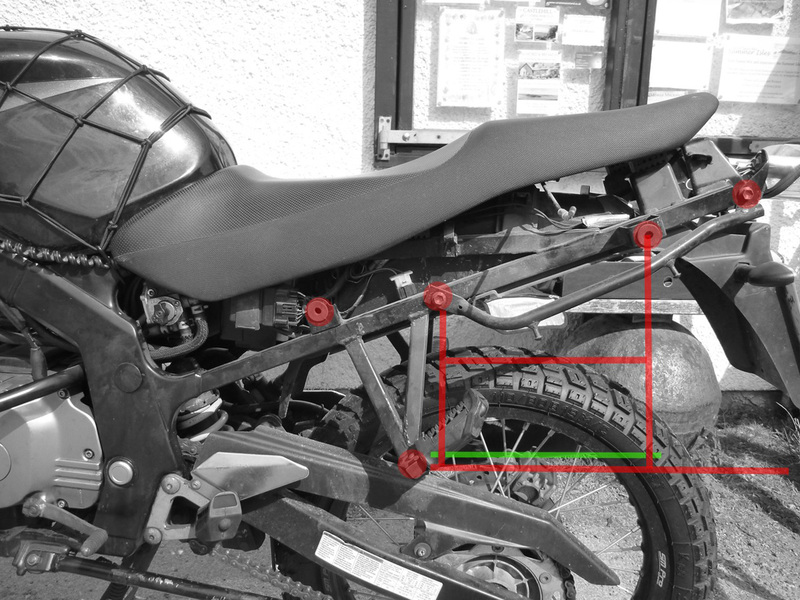 This entry was posted in AMH News, Project Bikes, Suzuki GS500R Overlander and tagged building your own rack, bulding an adventure motorcycling rack, ect tubing, hex-key clamps. Bookmark the permalink.